Calico is a low stress day-in-the-life community-sim where you move to a town of magical girls and are given a harrowing yet adorable task; Make the town’s cat café active and full of cuddly creatures again! You will journey to a small village of Magical Girls and other fantastical friends to fix up the cat cafe, as well as fill it with furniture, decorations, yummy pastries and most importantly CATS! Explore the village to find cats and other animals, including raccoons, deer, dogs, turtles, red pandas, foxes, and many, many more cuties! Interact with cats and other animals by petting and playing, all animals are interactive! Run your café by filling it with animals, furniture and yummy café eats! Get involved in a town community of magical girls, witches and other townspeople who you can help and befriend! Calico is being created by CatBean Games, a two person studio in Seattle, WA. 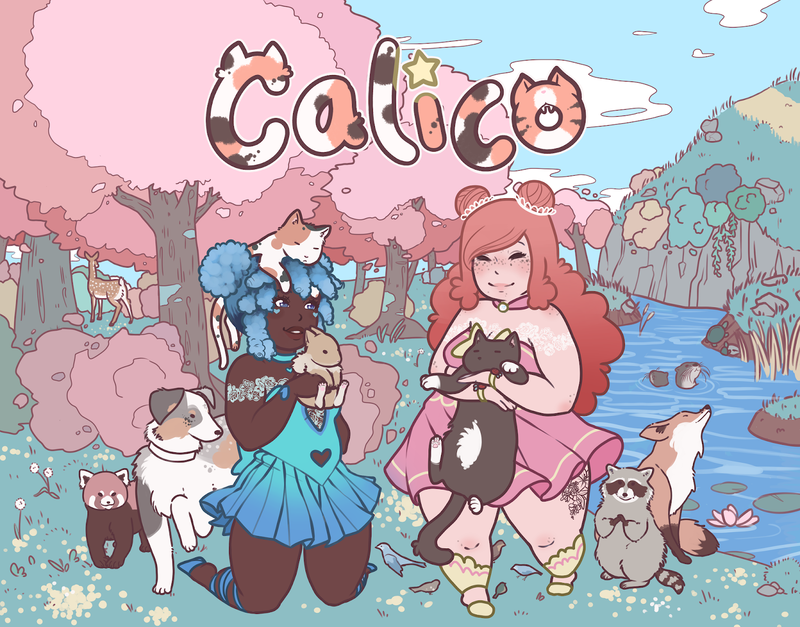 Kells is an artist and community manager from both New York City and Minnesota that was the first creator of Calico and is working on most of the art, as well as design. Andrew is a programmer from Ohio who is working on most of the Unity Development and technical design. Rob - Rob is our amazing potion asset creator, he will be helping us flesh out our inventory of assets so that players will have a lot to choose from! Diego - Diego is an animator who has been helping bring our magical girls to life! He creates incredible, full of life animations! Ninichi - Ninichi is our music magician for Calico! She is a UK-based composer for games, film & media. Her credits include: Shakey’s Escape, Cyclocube & Power Pool Slam. She loves music, playing games & cute & colourful things! Emi Evans, most notable for her performances in the soundtracks for the NieR series, Dark Souls, and Ace Combat: Assault Horizon will be contributing to a bonus music track for Calico! We are So excited to be working with her!